The write-up reads, "A line of decorative accessories designed by Ben Seibel and manufactured by Jenfred Ware, New York, comes in copper, bronze, brass or silver finish, on a magnesium, copper zinc and aluminum base. All pieces have a heavy double plating in all finishes, and then coated with a baked lacquer finish. Cigarette box retails at $6.50 in brass, copper or bronze and $7.50 in silver. Ashtray retails at $4.00 in first three finishes and $4.60 in silver." This is one of Ben's first commercial designs (if not his first). Mint items are difficult to find. Most pieces are found tarnished or oxidized from use and age. 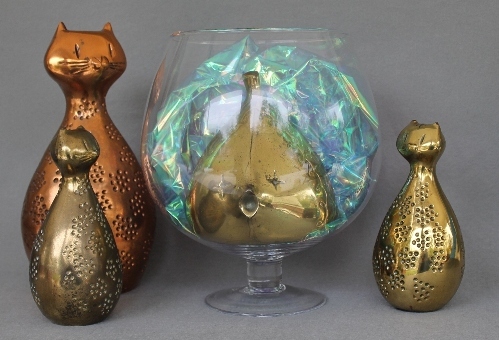 Typical items include: bookends, ashtrays, vases, lamps and serving plates. Since some stickers do not mention the Raymor name, this line could have been in production before the Raymor relationship developed.